Today we are surrounded by data. And we perspire data. Most of our daily life can be traced back in the data the we consume and produce. So we can safely say that today we are our data. When talking about data, often we eliminate from the equation an very central element: the "man", or the humanity in a broader and more philosophical tone. So, rather than looking at data as oil, let's look at the data from the perspective of the user. What can be done to humanize the data? Can we transform data in great new insight and provide this amazing results back to men and women, who can conversely thrive on this new information? 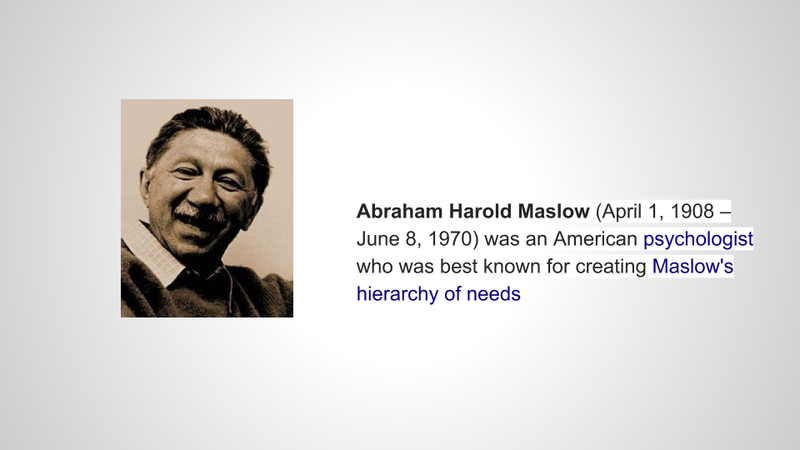 When I think of customer journeys and UX design, I always like to go back to the hierarchy of needs and Abraham Maslow, an american psychologist of the last century. 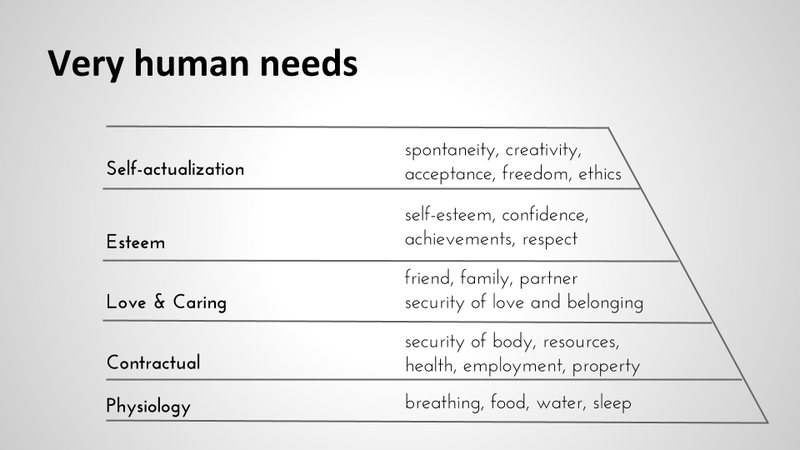 His hierarchy of needs is based on the ideas that our needs are stratified. At the bottom of the pyramid we need basic resources and activities: food, air, sleep, water, etc. Going up we find the need of contractual necessity, like ownership of our on body, of a place where to sleep, a bike to ride, a work to do. From that point on, our needs become more social. We need to interact with others, and going higher on the hierarchy we need for instance a sense of achievement and purpose, and the freedom to create, care for others and better ourselves and the world we live in. 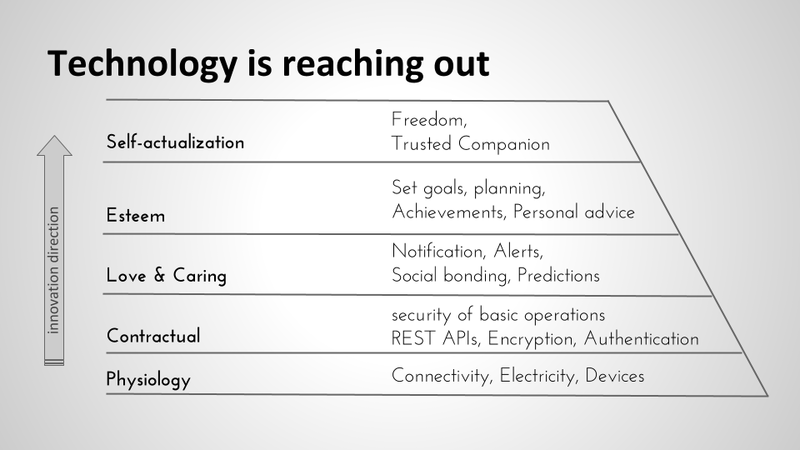 How much caring can technology be? So when talking of web and mobile apps and services, it makes sense to ask ourselves "what sort of relation do we have with it?". Is a given app reaching out and answering some human needs which are today left unanswered? Following the technology trends, I see that applications are competing to appeal to people and either exploit or answer human needs. For instance, notifications alert us about the next scheduled meeting, but also about the birthday of a dear friend. Lately there are also apps that nudge us about keeping up playing games or exercise. More services than ever are exposing a gamified interface. In general, smart services are guiding our lives with autopilots about what to read, who to follow, what to do and so forth. At the core of this higher level of engagement between machine and user we can surely pinpoint machine learning and big data. These two technologies work hand in hand. By collecting the data and applying the right algorithms, it's possible to understand what is trending right now and what derive the context and the profile of each user for a personalized experience. Data lakes and machine learning algorithms allow this process of sifting through the preferences and millions of events, and can be used to identify groups of people which share the same interests. A customer journey is now fully data-drive and customer profiling can be done using big data strategies such as Apache Hadoop in batch or live using streaming analytics processing frameworks such as Apache Spark or Akka. Profiling and segmentation are definitely at the core of personalized marketing and personalized user experience. They allow to provide information, recommendations and suggestions which are more relevant for a given user because of his /her own specific context. Of course while collecting data and applying algorithms is a necessary condition to provide great personalized and predictive services, not all the data is translated into insight and not all the algorithms provide great recommendations. Definitely the application must earn the trust and the engagement of the user. In this brutal and ephemeral market, where hundreds of new apps are available each day, only the best applications actually survive. Innovation fuels and stimulates the production of effective machine learning solutions which produce relevant results.